Automobile engineering projects: Six-Stroke cycle internal combustion engine ~ Engineering projects ideas for final year students & paper presentations collection blog. 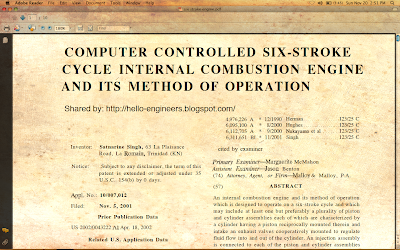 Title: Computer controlled Six-Stroke cycle internal combustion engine its method of operation. Department: Automobile engineering, Mechanical engineering. Can be used for: Paper presentations, Final year engineering projects for Mech and Automobile engineering students. The below project is an important concept for the automobile engineering students. Due to the advancement in the field of auto technology, understanding and working on these kinds of topics have become highly important for us. 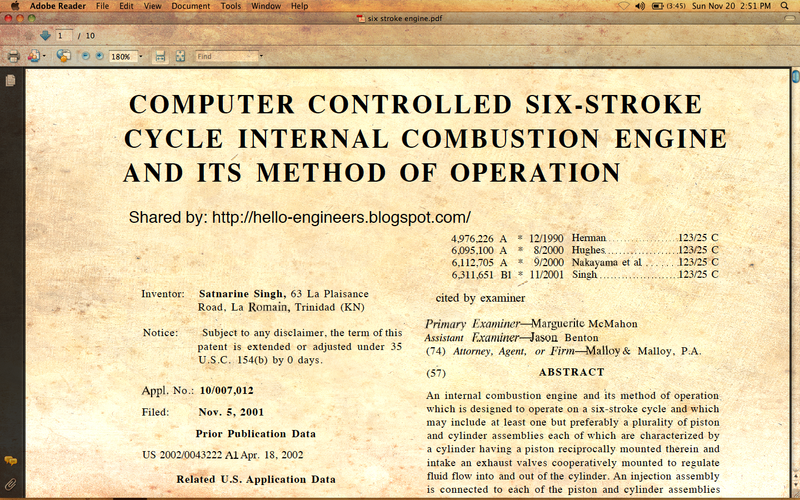 This invention and paper was by Satnarine Singh. Normally many automobile engineers and project enthusiast will have an interest towards developing an engine or a motor by themselves. But mostly these ideas wont turn into effective engineering projects because, it is not innovative and impressive for your exams and marks. So from the engineering examination perspective, innovation and extra effort is needed. So this SIX-STROKE engine will definitely help you! Non-technically this be project is basically to design an internal combustion engine that operates on a six-stroke cycle and which may include one or more piston and cylinder assemblies. The present invention is directed towards a computer controlled internal combustion (IC) engine, and its method of operation, designed to operate on a six-stroke cycle and specifically includes the injection of water into the combustion chamber or cylinder of each of a plurality of piston and cylinder assemblies, during a predetermined portion of the six-stroke cycle. More specifically, the quantity and timing of the water injection is controlled and regulated to the extent that the injected water is prevented from turning into steam even after reaching sufficiently high temperatures because of the continuously increasing pressure within the cylinder, due to the compression of gases therein, to the extent that the water is maintained in a liquid state until the beginning of an intended "auxiliary" power stroke. More specifically, the IC engine of the present invention comprises at least one, but preferably a plurality of piston and cylinder assemblies. Each such piston and cylinder assembly includes a cylinder which serves as a combustion chamber having a piston reciprocally mounted therein, and further including intake and exhaust valves associated therewith so as to regulate the flow of fluid into an out of the cylinder. A source of ignition is also connected to each chamber and may be in the form of a spark plug, glow plug or any other applicable and/or conventional means of igniting a combustible fluid, such as a gaseous mixture of fuel and air.